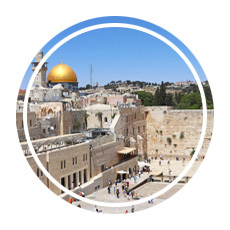 Our trip to Petra was short, sandwiched between Israel and Egypt with only two days to explore before it was time to depart. 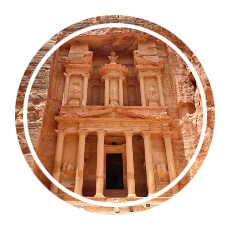 Our expectations were managed, and our goals for Jordan were simple: cross the border, experience Petra, fly to Cairo the next day. When Petra changed from an anticipated day trip to an unforgettable memory, all that was left to do was drive four hours north to Amman to catch our flight to Egypt. 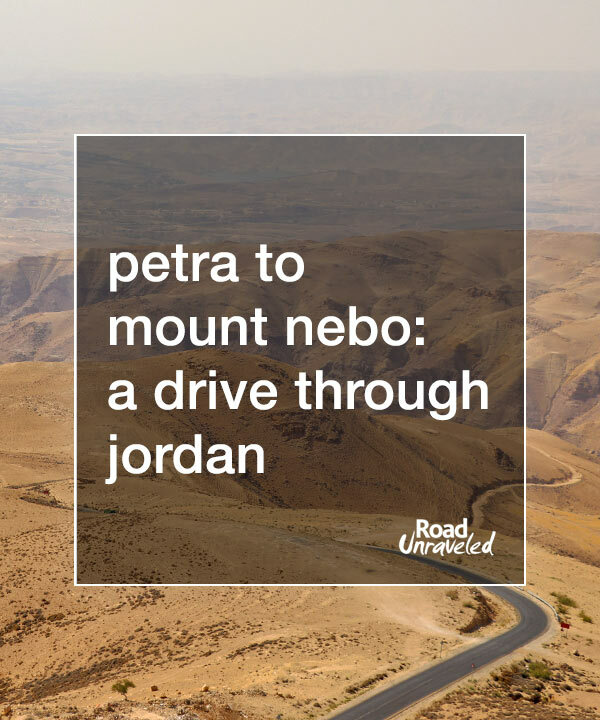 Little did we know that brief road trip would take us through a surprising landscape and to the top of historic Mount Nebo to create a day just as memorable as our visit to Petra. 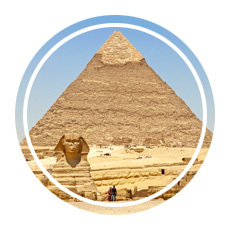 Our trips are often fast-paced with very little downtime, a necessary requirement as we work to maximize our vacation time and see as much as possible within very short days. 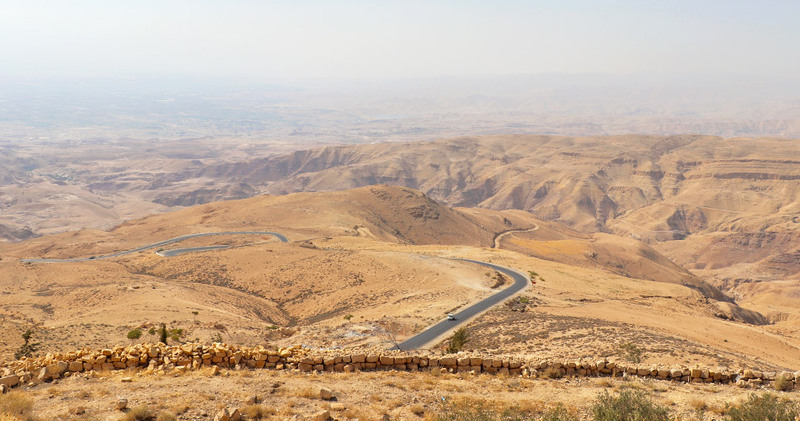 When our itinerary required a lengthy drive from Petra to Amman, we both bemoaned how a whole half day of touring would be sacrificed to sitting in the back seat of a car. It seemed sad to lose so much time to staring out car windows, but since the land transfer was unavoidable we were resigned to making the most of it. Within minutes of departing from our hotel we forgot our frustrations. 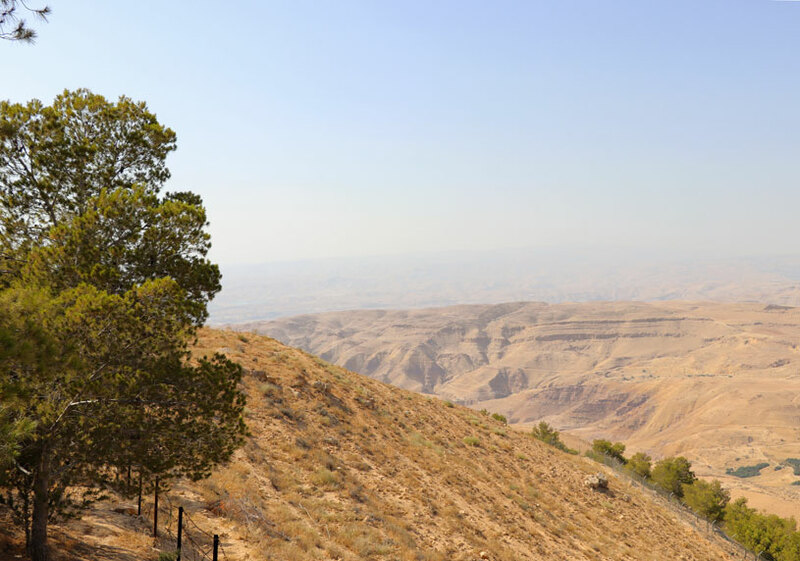 Our road trip took us from the shores of the Dead Sea to the top of Mount Nebo, and every turn showed us that taking it slow once and a while can be a wonderful way to spend a vacation day. 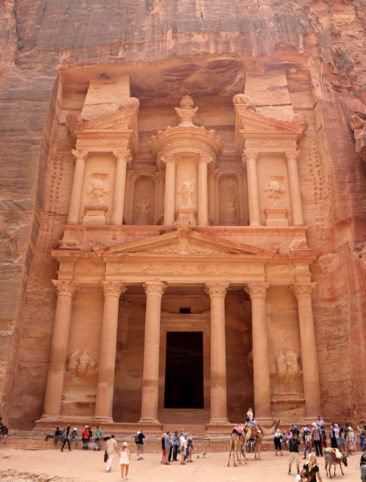 If you find yourself on a car ride through Jordan, here is a sampling of some of the incredible sights you might see. 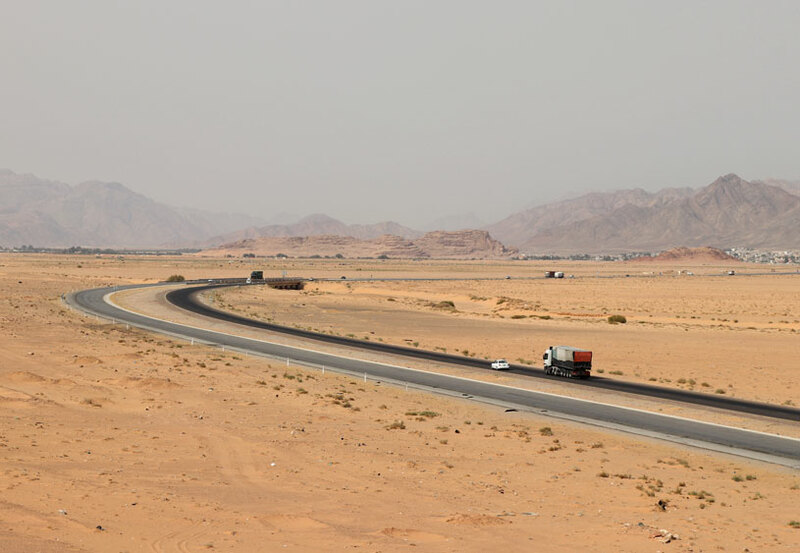 Our Jordan road trip technically started when we crossed the border from Israel, when we started our journey from the country’s southern tip northward to Petra. Before reaching Petra we passed Wadi Rum, which translates from Arabic to Valley of Sand. 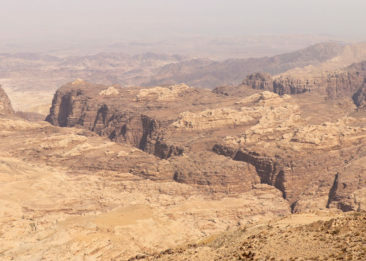 Comprised of granite and sandstone, Wadi Rum looks otherworldly. Red sand shifts in the breeze, with clouds rising up from the ground as it creates a hazy screen in front of the rocks that jut out of the ground. 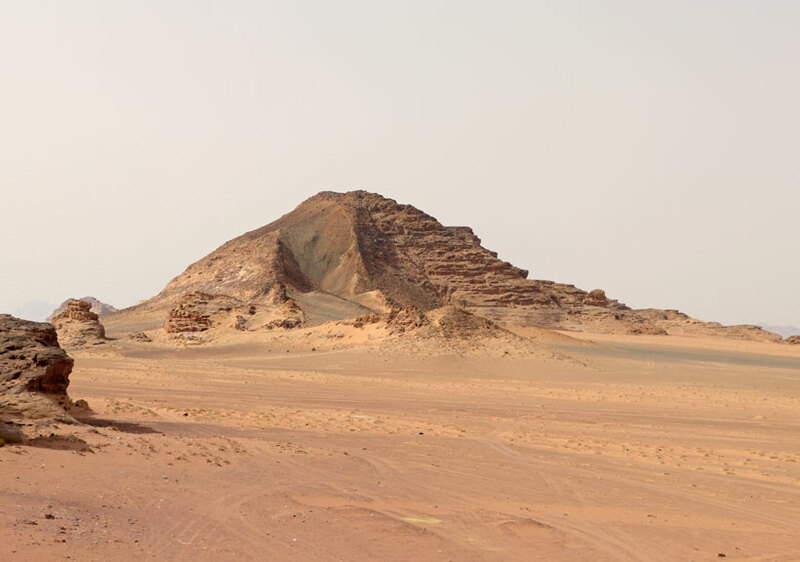 While tourists flock to Wadi Rum for rock climbing, camping, and camel rides, most visitors are familiar with its unique landscape from films like Lawrence of Arabia, Rogue One: a Star Wars Story, and The Martian. Matt Damon, who starred in The Martian, called it, “One of the most spectacular and beautiful places I have ever seen, and like nothing I’ve ever seen anywhere else on Earth.” As we stood atop a vista overlooking the landscape, we had to agree: it looks like the desert, the mountains, and another planet all at once. 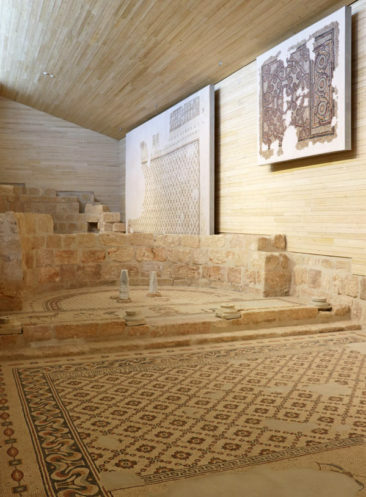 Our visit didn’t afford us the chance to camp or partake in the activities many tourists seek out, but it’s an impressive place to see and a great place to include when road tripping through Jordan. 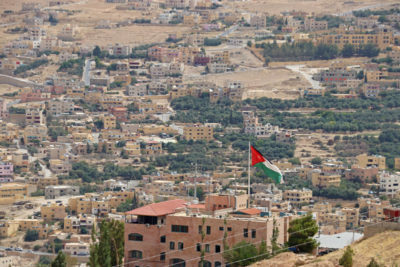 The town that has built up around Petra, Wadi Musa, served as the starting point for our lengthy drive to Amman. 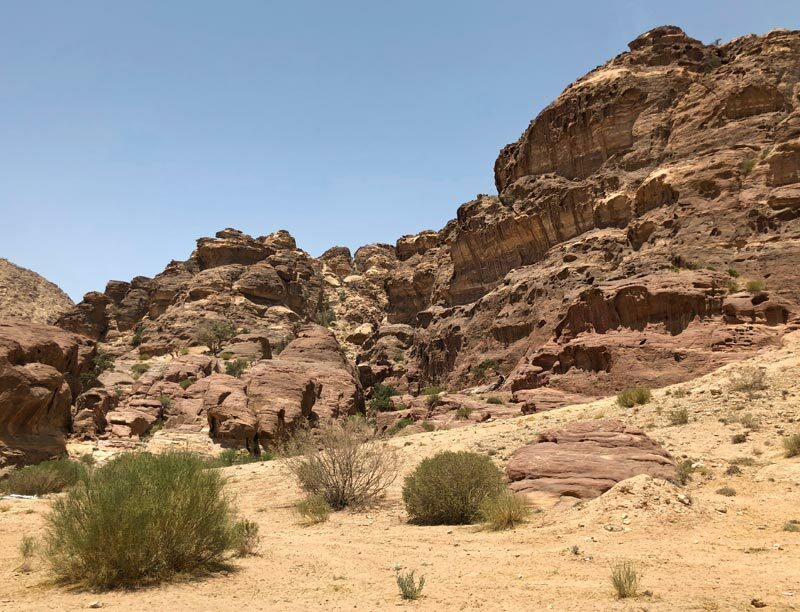 We departed from our hotel, which was just a mile from Petra, and continued north on a winding road that curved around a fantastic view of the Petra Valley. From so high above it was barely possible to see some of the sights we took in at eye-level just a day before, but we could make out the openings where tombs were carved into the sandstone and where the hills hid spots like the Treasury and the Street of Facades. For all of its ambiance and the hundreds of tourists who descend on Wadi Musa, the town is small and Petra is quite isolated from much of the rest of the country. It’s only from vantage points like the one we found as our road trip began that really show Petra’s place in the landscape. The Abarim Mountain Range runs from the desert and the Dead Sea to Mount Nebo, its highest point. The mountains are closer to hills and cliffs than true mountains, but nevertheless they are striking in how they divide the landscape. Around the mountains we saw Bedouin camps, which were different from the camps tourists sleep in as part of “authentic” Jordan experiences. 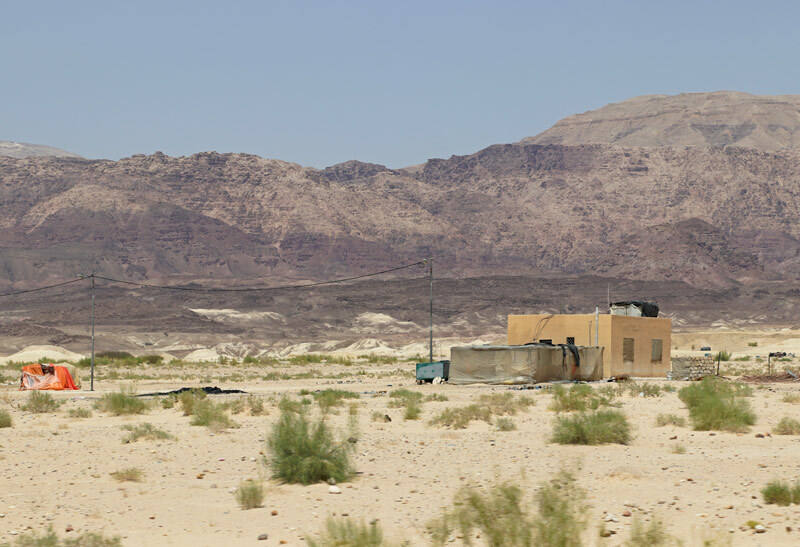 These camps house Bedouins who don’t cater to visitors; they are homes for the nomadic people who have lived in the area for centuries. 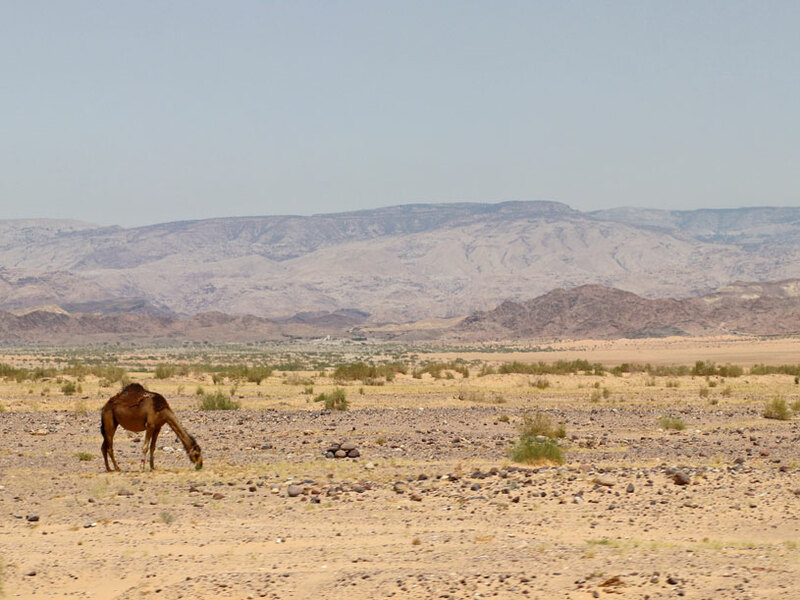 We were also surprised by the number of camels dotting the landscape and how they were frequently unattended. Our driver told us the camels often roam away from their home, sometimes for days or weeks, but they have excellent memories and always know how to find their way back. 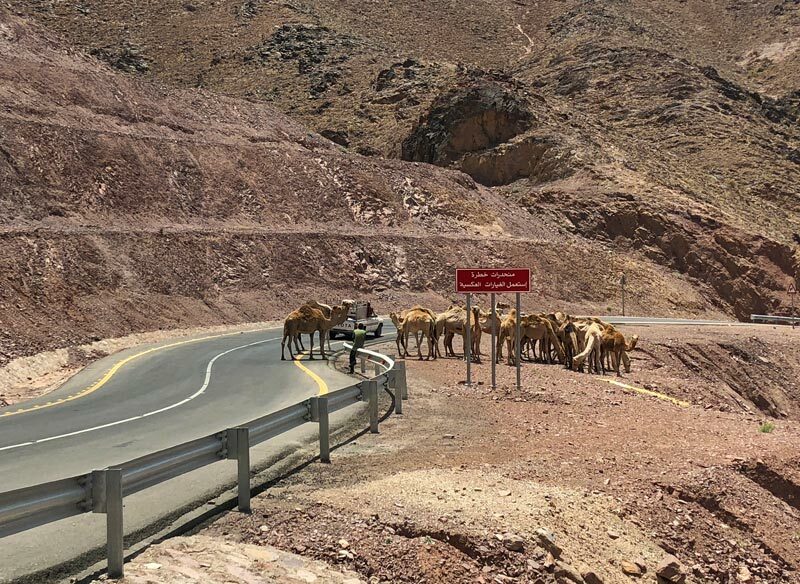 As our car drove past, the camels would sleepily lift their heads to look at us, turning as we disappeared from view. We enjoyed this game for hours, watching as camels would look up and down again as the car briefly interrupted the quiet. 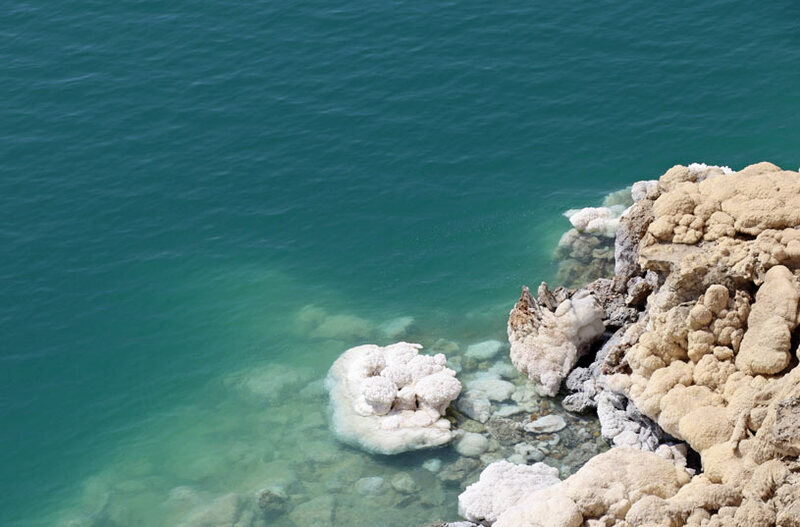 We had the chance to experience the Dead Sea while in Israel, when our day trip to Masada took us just down the road to a tourist resort where we could float in some of the saltiest water on earth at the lowest point on the planet. 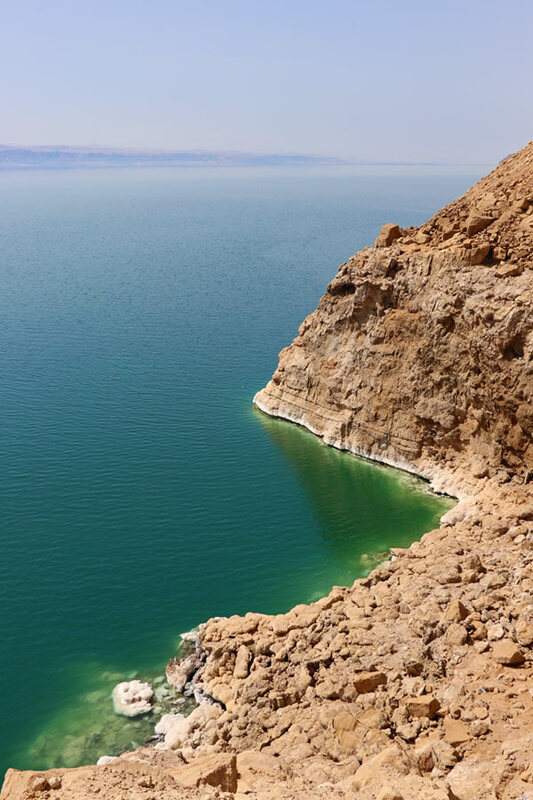 Our road trip took us along the eastern shores of the Dead Sea, where we had the chance to see that the body of water is not one but two lakes separated by a thin strip of land. We enjoyed visiting the Dead Sea, but we both liked it even more during our road trip. From a few miles away we could see its seafoam green hues that sometimes appeared blue and sometimes looked murky, changing under the sun at every turn. 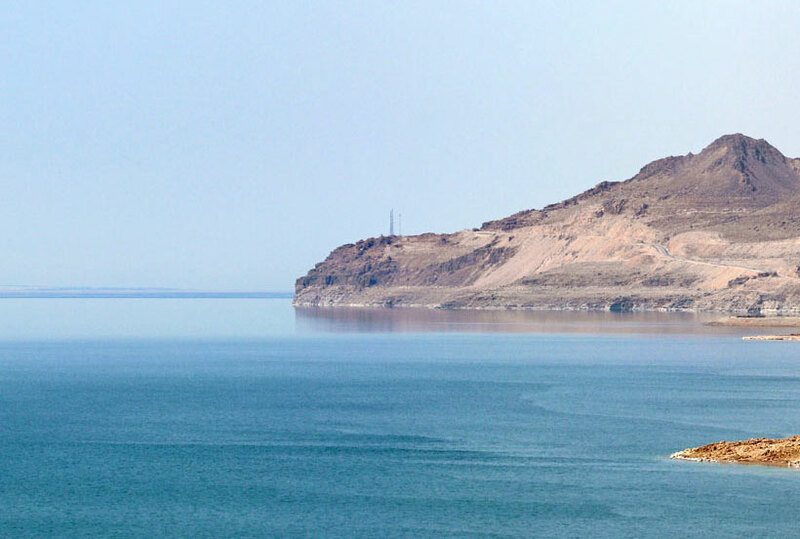 When traveling it is nice to get as many different perspectives on a place as possible, and our road trip through Jordan was a great way to appreciate the Dead Sea in a new way. Our road trip continued to Mount Nebo, the highest point in the Abarim Mountains and the most surprising highlight of our journey. 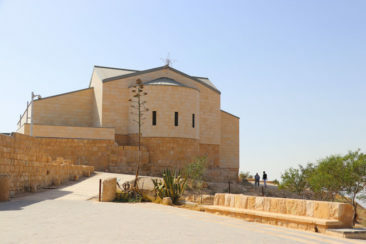 Mount Nebo has biblical significance for being the place where God showed the promised land to Moses. 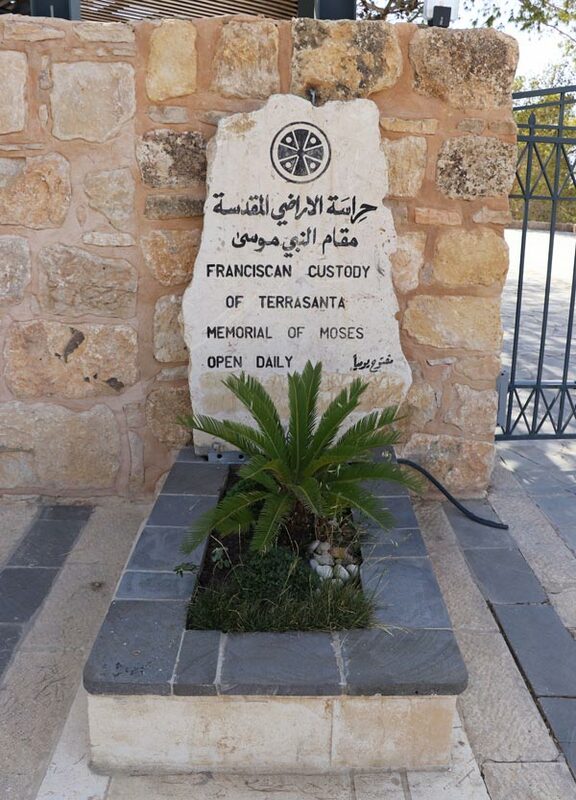 According to the Christian tradition, Moses died and was buried on Mount Nebo, although his resting place has not been discovered. 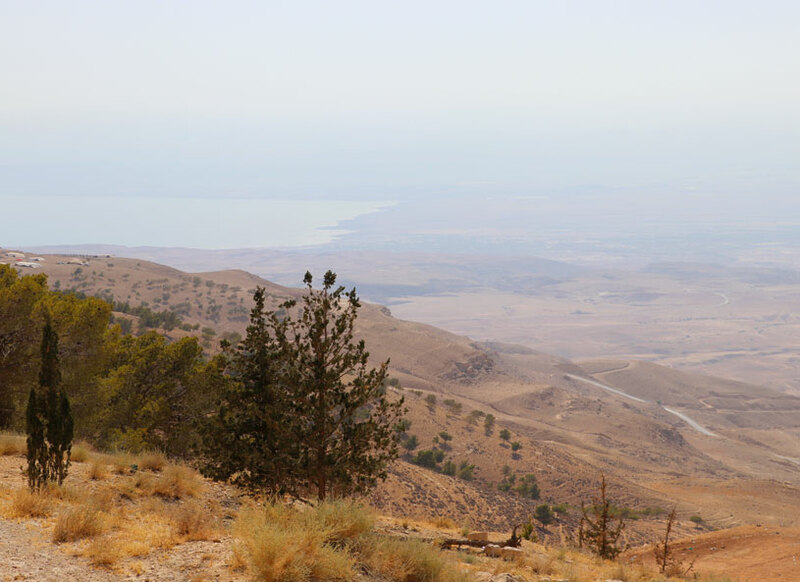 Standing on Mount Nebo where Moses once stood, overlooking the valley, seemed underwhelming at first. The expansive view is of nothing more than dry desert land, trees that seem to be browning to match the landscape, and the Jordan river trickling in the distance. 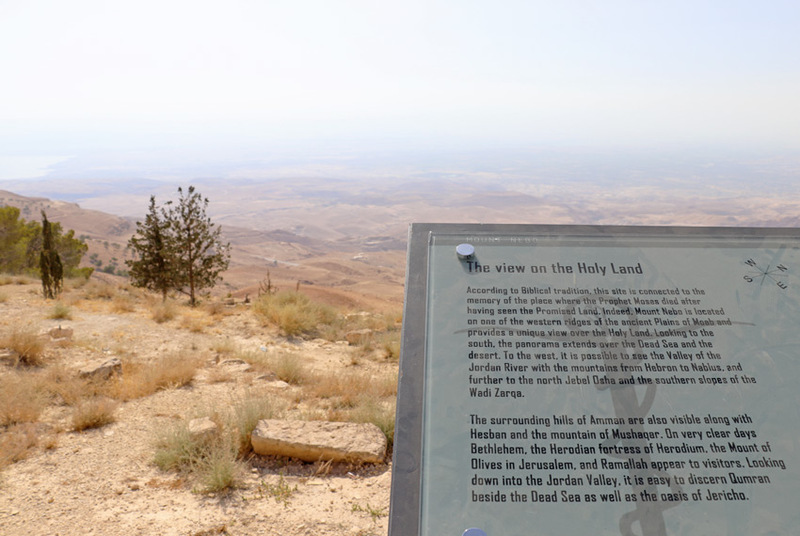 Centuries before, though, that same view would have revealed lush green pastures and a flowing river, and that’s what I imagined as I looked out into the distance from the viewing deck at Mount Nebo. Even today, when everything looks sandy and brown as far as the eye can see, Mount Nebo is an incredible place—and it’s so much more than its viewpoint. We were most intrigued by the Byzantine church, which was built in memory of Moses during the 4th century AD. 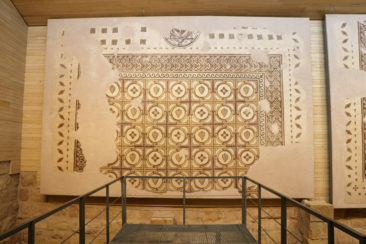 The church is full of gorgeous mosaics, some of which depict hunting and wine making. 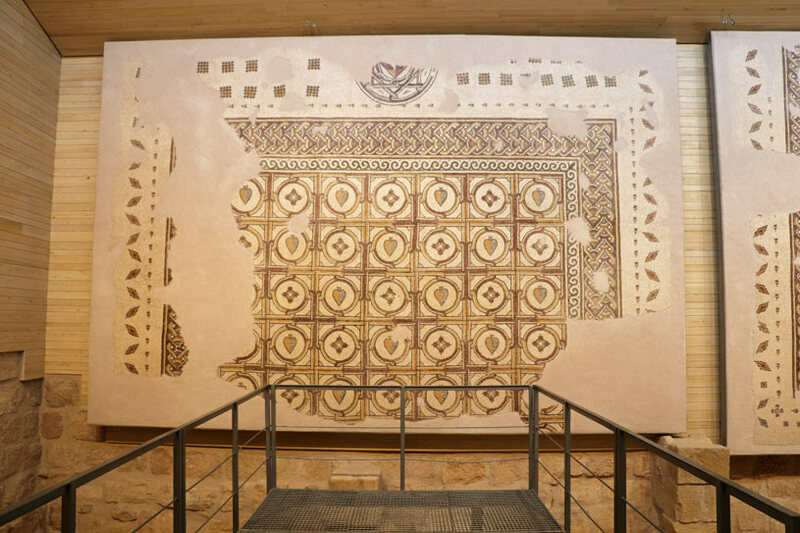 The church also has six tombs that have been discovered, and while none of them appear to be for Moses they display additional mosaics. 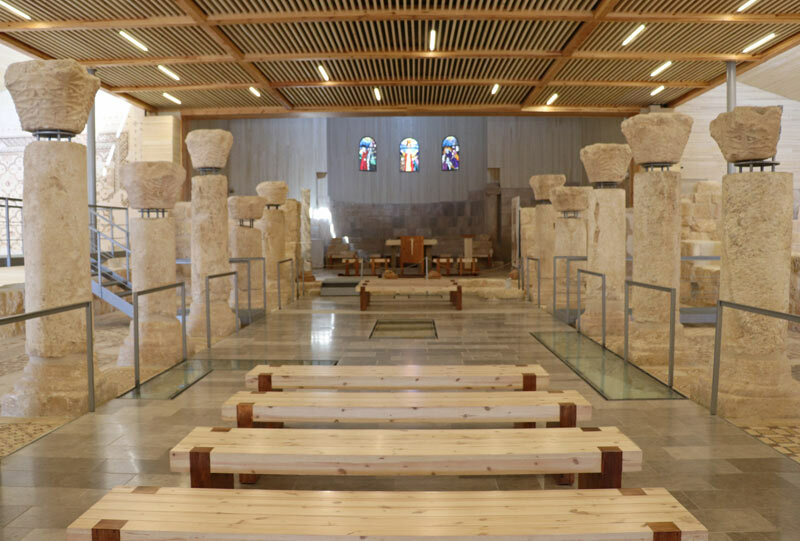 This video, which we took during our visit, shows what the church looks like when standing by its alter. 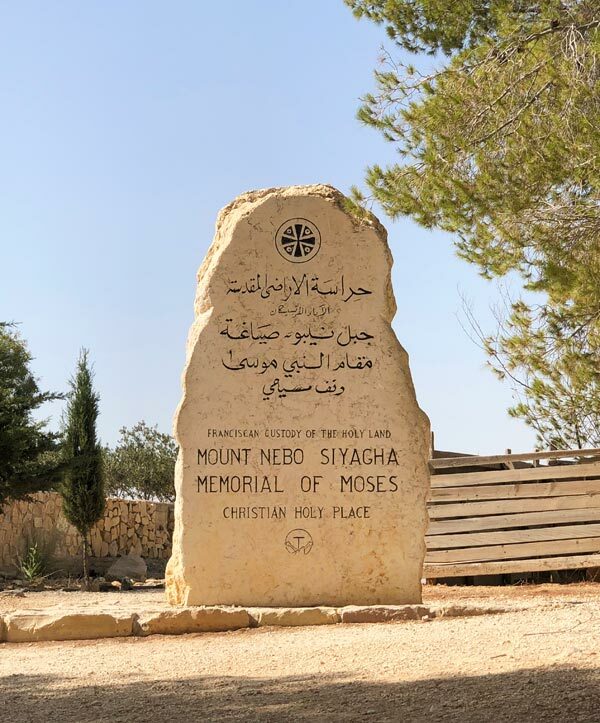 Mount Nebo is a perfect place to stretch your legs while road tripping through Jordan, and we found a few interesting spots as we walked along the grounds. 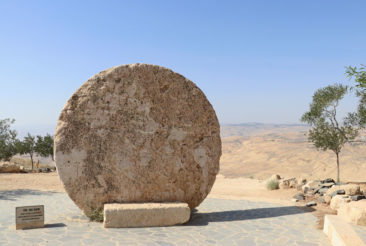 The Abu Badd, an enormous circular stone that once served as a church door, is found on the site, as is the Serpentine Cross. 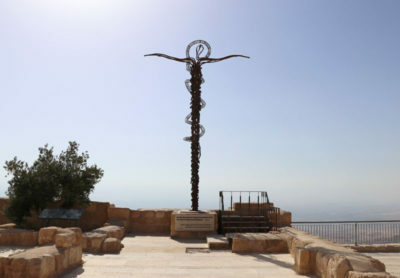 The cross combines the symbolism of the cross upon which Jesus was crucified with the serpent Moses took with him to the desert, and it is an unmissable spot at Mount Nebo. 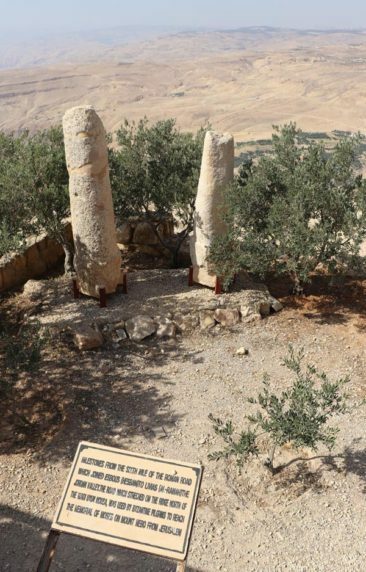 We spent about 30 minutes at Mount Nebo, which is all our driver could allow us and ended up being a sufficient amount of time to explore. 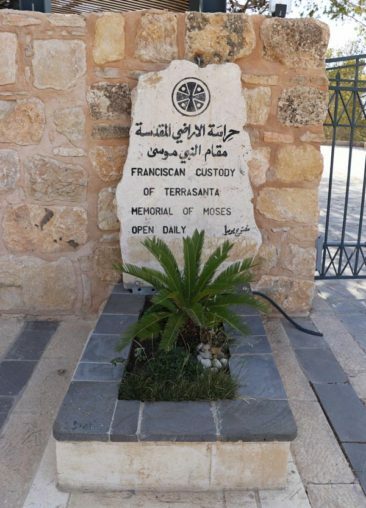 Admission was inexpensive (we paid 2 dinar, or 3 USD per person), and we had a chance to see everything along the pathway that connected the ticket booth to the church and the overlook point. Mount Nebo was a beautiful, surprising stop on our road trip, and it’s a nice place to include whether you are visiting Jordan to see Petra like we did or are looking to experience as much of the country as possible. 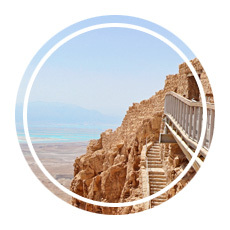 When we buckled our seatbelts and our driver pulled away from the hotel, I was sure I had nothing more to look forward to than an uncomfortable nap and a few hours of scrolling through my phone on the way to the airport. Four hours later, when we arrived at the departures terminal, I realized I had used my phone only to take photos of the roads we traveled and Mount Nebo. 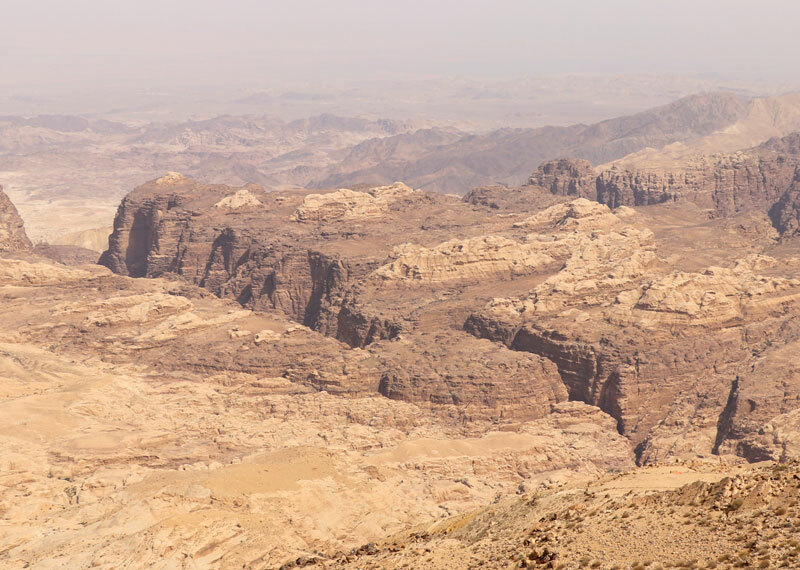 Jordan’s landscape captivated us that afternoon, and we felt both relaxed an infinitely more appreciative of the beautiful country we were leaving too soon. Although we won’t abandon our break-neck travel pace anytime soon, our road trip through Jordan and our visit to Mount Nebo helped us remember the real value that comes from every journey. 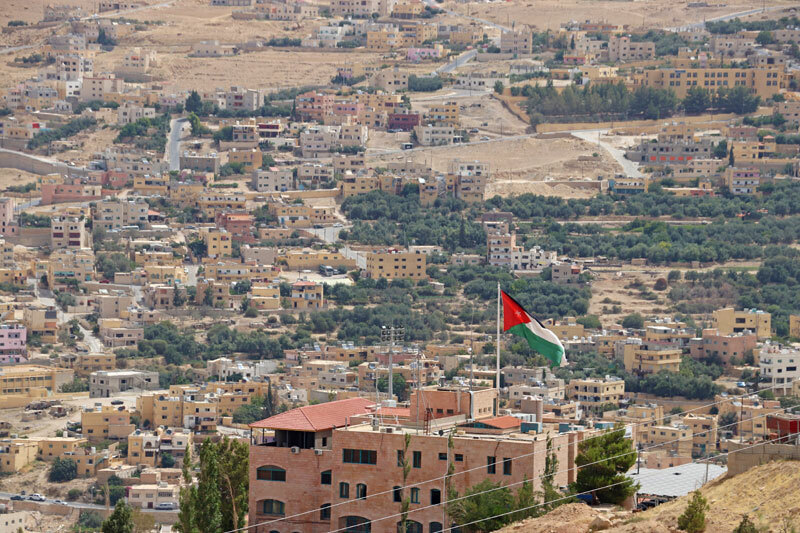 If your travel plans will take you through Jordan, a drive from Petra to Amman will uncover many of the same surprises we found. 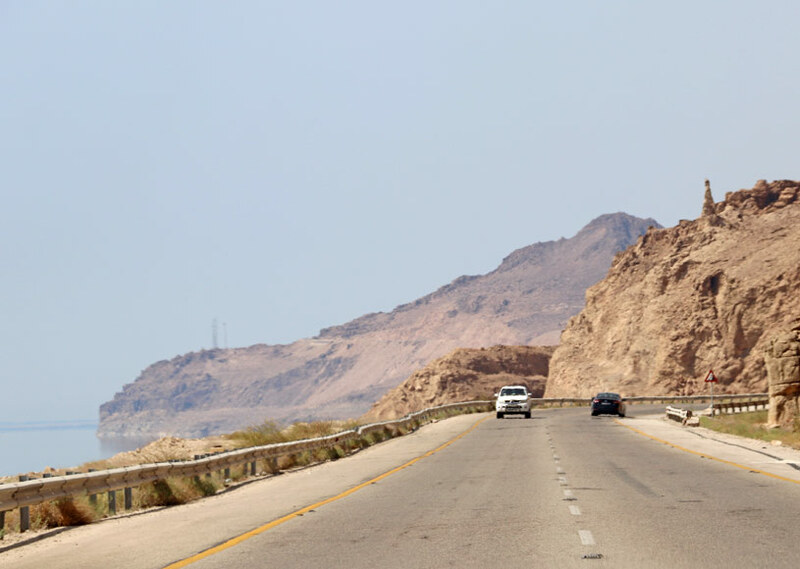 Leave a comment below and let us know if a similar road trip is in your plans—and let us know if you have any great road trip tips to share! 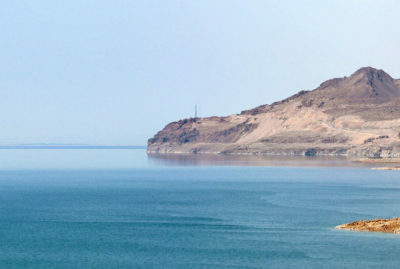 Want to read about more interesting places in this part the world? Check out these articles!